Solomon Islander Ruby Awa is relishing the opportunity to move north to the Federated States of Micronesia (FSM) to help reduce family violence. 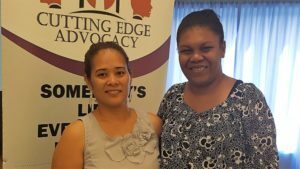 With support from the Australian Government-funded Pacific Women program, she’s assisting the roll out of new laws protecting women and children from violence. A veteran human rights defender of over 10 years with the Regional Rights Resource Team (RRRT) and with a background in international law, Ruby says the assignment is not an easy one. The latest FSM Family Health and Safety Study estimated one in three women in relationships experience physical and/or sexual violence in their lifetime. In some areas, more than every second woman will experience partner-related violence. Ruby will be working closely with Norleen Oliver, the FSM National Gender Development Officer, as well as government, civil society and development partners like the United Nations, to support the strengthening of referral pathways and services for victims of violence.